Lose yourself in one of the East Neuk’s most popular towns at this cosy hideaway in the heart of Elie. It’s not difficult to see why Elie is the jewel in the crown of the ‘Scottish Riviera’. Its stunning sweep of beach, fine dining restaurants, quaint streets and pretty houses make for an idyllic break. Think long walks on the beach, fantastic watersports, delicious fish and chips and evenings spent holed up in cosy pubs. 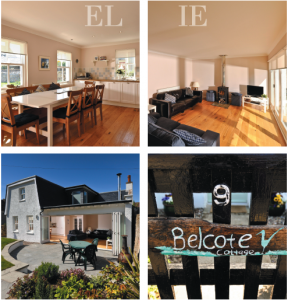 If you’re looking to get away from it all in Elie, there’s no better place to make your base than Elie Cottage, a newbie on the self-catering scene in the village, just a sandy hop, skip and a jump from the beach. It’s the ultimate combination of the charm and character of a cottage that’s 150 years old and the convenience of a property that’s been recently refurbished to an exceptional standard. Think bags of room for families, with great amenities, including a wood-burning stove and a ping-pong table, and a spacious garden. It sleeps eight in four bedrooms across two spacious floors so it’s perfect for groups needing both intimacy and space from one another. Décor is chic, simple and modern, everything is completely spotless and even if the wind is howling outside, you can rest assured that you’ll be as snug as a fish supper in newspaper indoors. Not that you’ll be able to resist exploring that is. Elie Cottage is equipped with a great kitchen, and a visit to Ardross Farm Shop is a must to stock up on foodie goodies to prepare yourself. From their local meats to the farmhouse cheeses, home baking and tasty preserves, there’s something for every palette. However you’re also spoiled for choice for places to eat out, and you’ll find some of the best seafood in Scotland in this small village. Sangsters has a nationwide reputation for fantastic fine dining, while the Ship Inn does the best fish and chips this side of the Anstruther Fish Bar (which in itself is only a short drive away). At the end of a long day, it’s quite a treat to tuck in to their hearty fare while looking out towards the sweeping bay, and if you order their fish and chips, you’ll get two battered fish on your plate. As for how to spend your days, adrenaline junkies need look no further than Elie Watersports. Because of Elie’s sheltered position, it’s a great spot for beginners to try their hand at a whole variety of activities, from sailing and kayaking to windsurfing, canoeing and water skiing. For those looking for something a little more sedate, pedaloes are available for hire and organised sailing trips are available. And nothing beats a walk on the award-winning beach, reached by a short path from the luxurious cottage. Still got itchy feet? Elie is up against nearby Crail, Pittenweem, St Monans and Anstruther for the title of prettiest village in the East Neuk, so take a trip to each one and decide for yourself. We wouldn’t blame you however if, surrounded by all this beauty, you simply decided to hole yourself up in the charming Elie Cottage. The perfect mix of the old and the new, it’s everything you could want from a seaside getaway. Availability: Check our availability calendar. Right in the middle of Elie just 30 yards back from the beach. View our detailed location map. Right on the beach towards the southern end of the beach. View our detailed location map. We are always trying to put together tasty offers in partnership with the best places to eat and visit. Please enter your email to receive them.